Lining Services reports it has recently completed the fibreglass lining of a large bund area for Messrs Centec International Ltd, Middlewich, Cheshire. 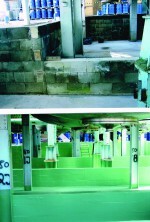 The before and after photographs illustrate the effectiveness of fibreglass lining. The bund is constructed in blockwork and concrete and designed to contain organic solvents in the tanks above. The company says the fibreglass lining will protect the bund from drips and leakage if an accident should occur. The fibreglass lining should also be totally resistant to the organic solvents. The work took approximately two weeks to complete and a video of the work being carried out is available on the web site at www.liningservices.co.uk, or for further details please contact Steve Dowdell on 01206 570090.